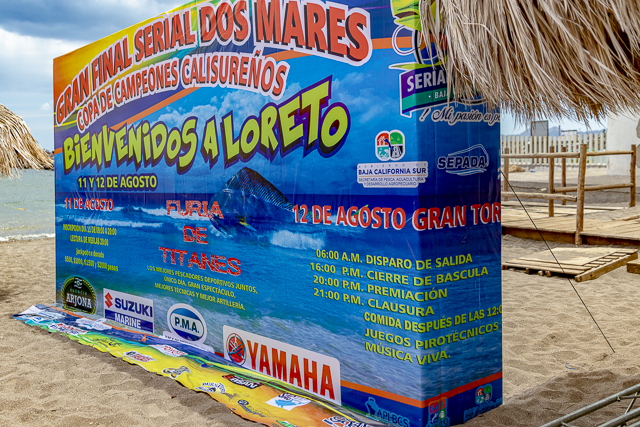 The “Gran Final Serial Dos Mares Copa de Campeones Calisureños,” (the Gran Final) could be compared to the Olympics, inviting the best of the best of Loreteo sportfishing, all winners of the sportfishing events held during the preceding twelve months throughout Baja Sur coming together to compete among themselves depending on their angling skills and local knowledge. 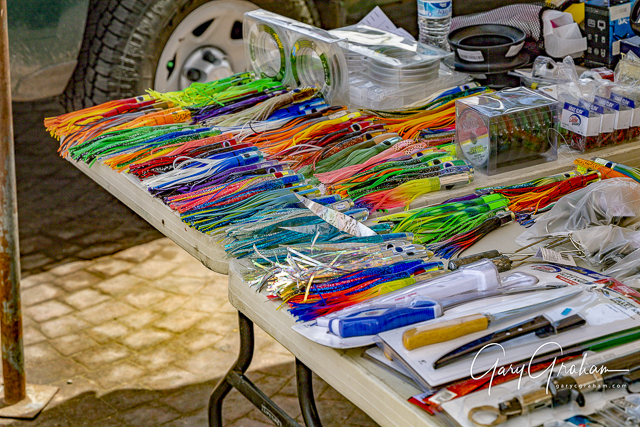 Although an impressive list of prizes and cash are offered, for many, bragging rights are the real prize! icipalities which include: Mulegé, Loreto, La Paz and Los Cabos. 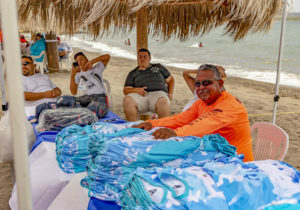 Saturday’s registration wasn’t scheduled until noon and the blazing Baja sun which by that time was adding to the sweltering atmosphere of the beaches around the Sea of Cortez where the FONMAR crew and volunteers were already erecting canopies, fine-tuning the sound system and decorating the stage with banners. Some volunteers were piling the tables high with the tournament t-shirts and hats as many others fired up their laptops and settled down in preparation to register the eager teams. 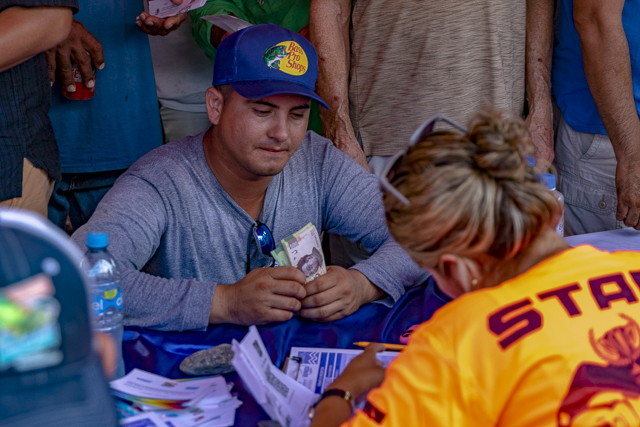 Long before opening time, a line of teams anxious to complete their registration had begun to form, eager to trade their cash for an entry. 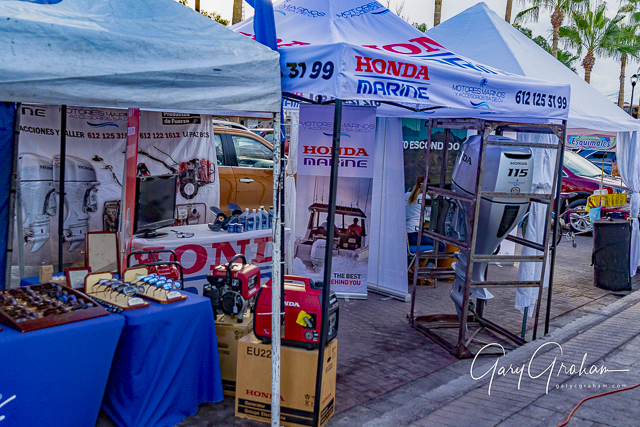 Sponsors added final touches on their elaborate displays of everything from fishing lures to huge outboard motors, some of which would be part of the winner’s prizes. Colorful bicycle-powered food carts joined the sponsor lineup. 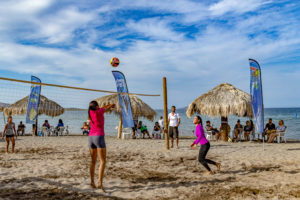 There was even a volleyball net strung as the sound system blared out an eclectic mix of Mexican and American popular hits. all oddly adding to the fiesta atmosphere, or the County Fair? entertaining the large crowd of spectators. 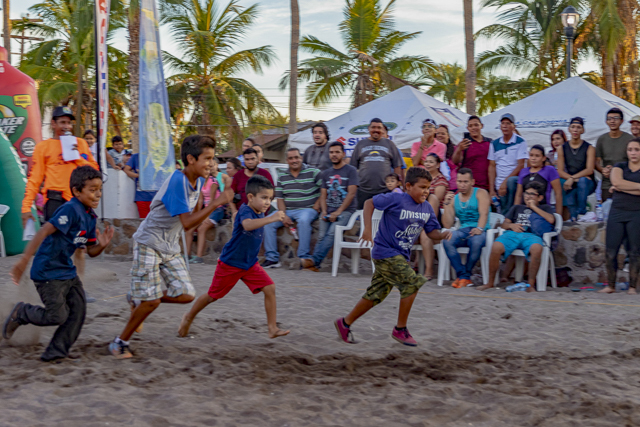 Children foot-raced for prizes and trinkets. Volleyball teams competed as spectators and waiting teams cheered for their favorites. The length of the line of teams diminished in step with the sun as it slowly dropped behind Baja’s Sierra de la Giganta’s mountain range and dusk turned to dark. Finally, registration closed; there was an increase to 115 teams from 2017. 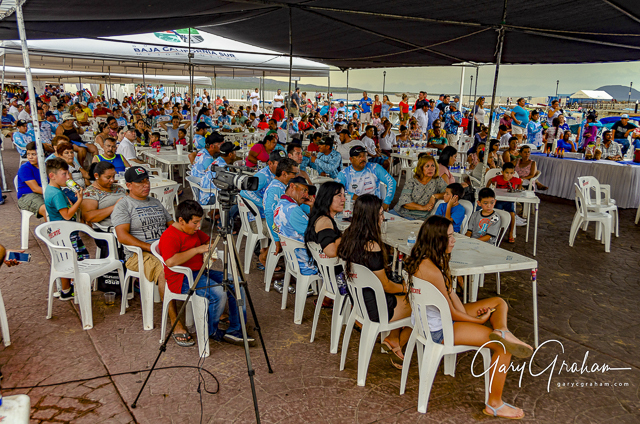 Captain’s Meeting was called to order by Gonzalo Alamea, Tournament Director, Dos Mares 2018. 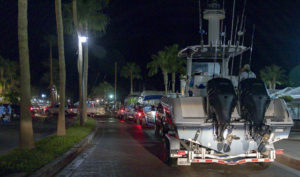 The rules were lengthy, and changes included a redrawn grid, a requirement to report the location of any hook-ups, and a rule eliminating any boats with three outboards and/or inboards from entering the tournament. There was little discussion about the rule changes and the meeting went smoothly. lookers. Shouts of teams greeting and kibitzing with each other could be overheard above the noise of motors idling, outboards starting as the line dwindled down. 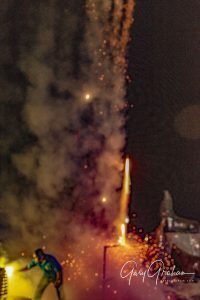 At precisely 6:30-a.m., a loud bang followed by the whoosh of bright red flares streaking from the jetty surrounding the Loreto Marina signaled the start of the one-day tournament. Many boats appeared to head into the sunrise. 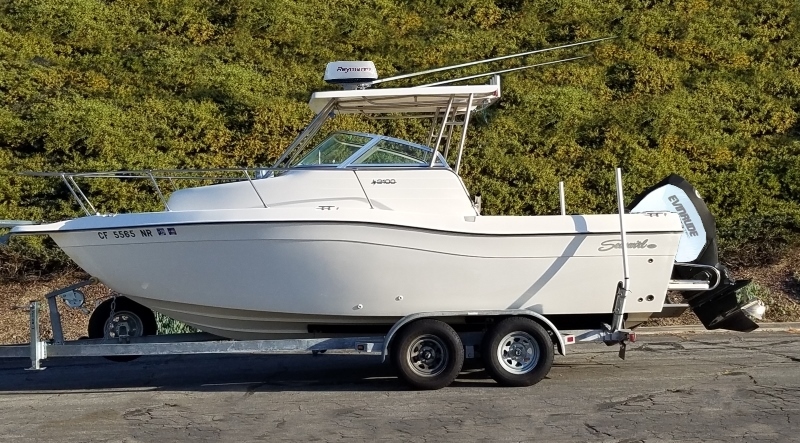 Rumor had it that the larger dorado caught on Saturday in the 26th Annual Tourneo Pesca and most of the other dorado located in the farther offshore area by boats pre-fishing the “Gran Final” were well within range, especially with the calm seas and fast boats. 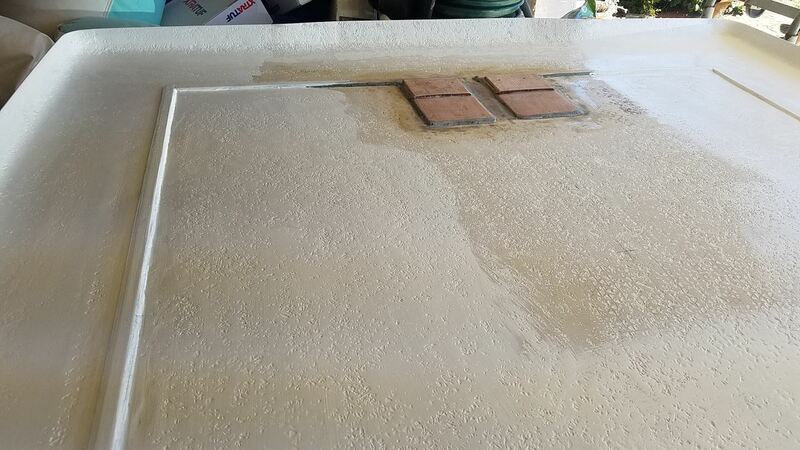 At noon the Weigh-Station opened and awaited the first fish. 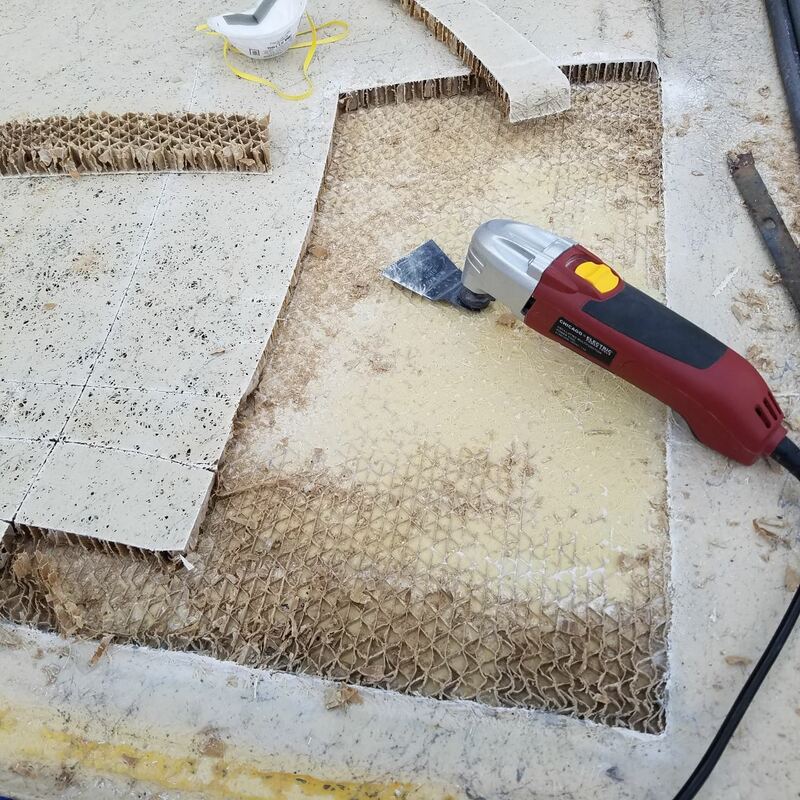 The crew was optimistic as the VHF radio crackled with hookups and boated fish headed for the scales, providing hope that this year’s catch wouldn’t be a repeat of the small fish of last year. 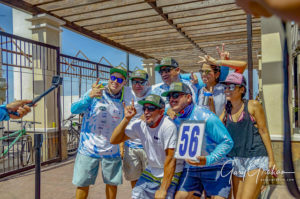 Only twenty-six dorado were brought to the scale weighing in the double-digit range before the official closing time of 4:00-p.m., though there were many more that teams elected not to bring to the scale. 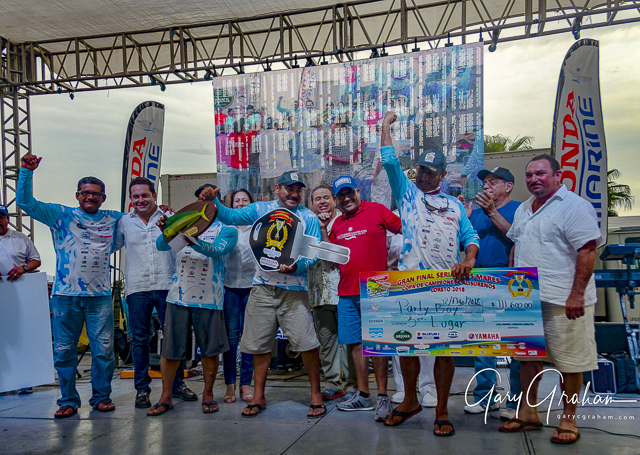 “Team Party Boy” led by Jesus Salvador Agundez was the first to arrive to the scale; removing the tarp, they uncovered a sizable dorado. 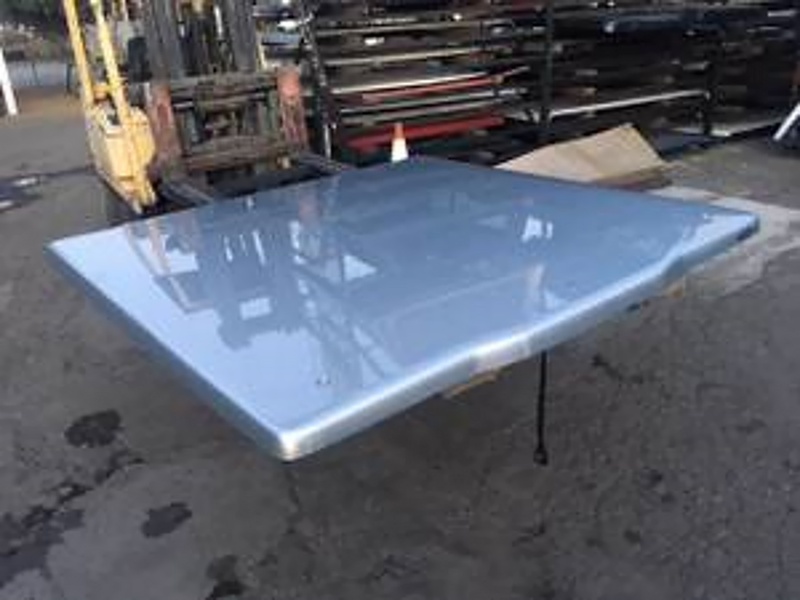 When the weigh-master declared the weight to be 38.8 pounds, it clearly placed them in first-place. 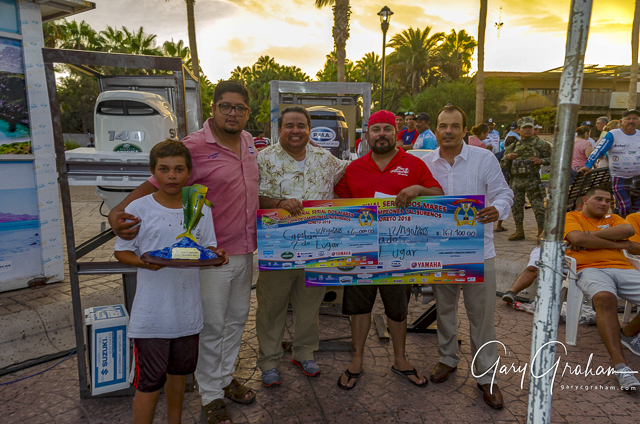 Several more fish arrived that didn’t come close to the current leader until “Team Marmakos” with angler Ariel Negrete Alanis with his team’s catch arrived at 12:52-p.m. 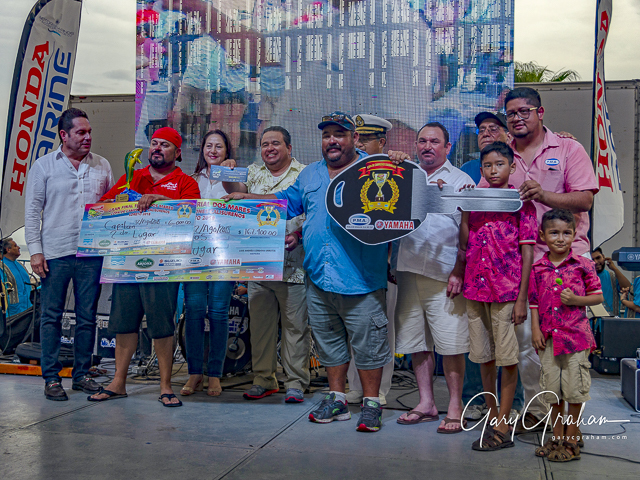 When the digital scale finally settled at 42.5-pounds placing them at the top of the leaderboard, “Team Party Boy” dropped to second place. 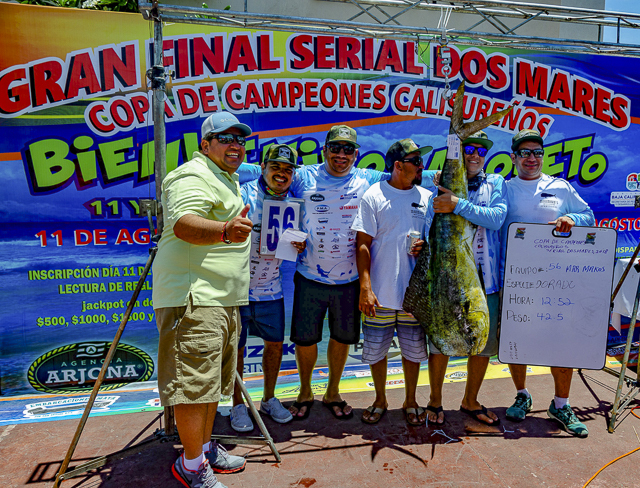 “Team Marmakos” hung around the entrance to the scales carefully checking out each subsequent dorado that arrived. 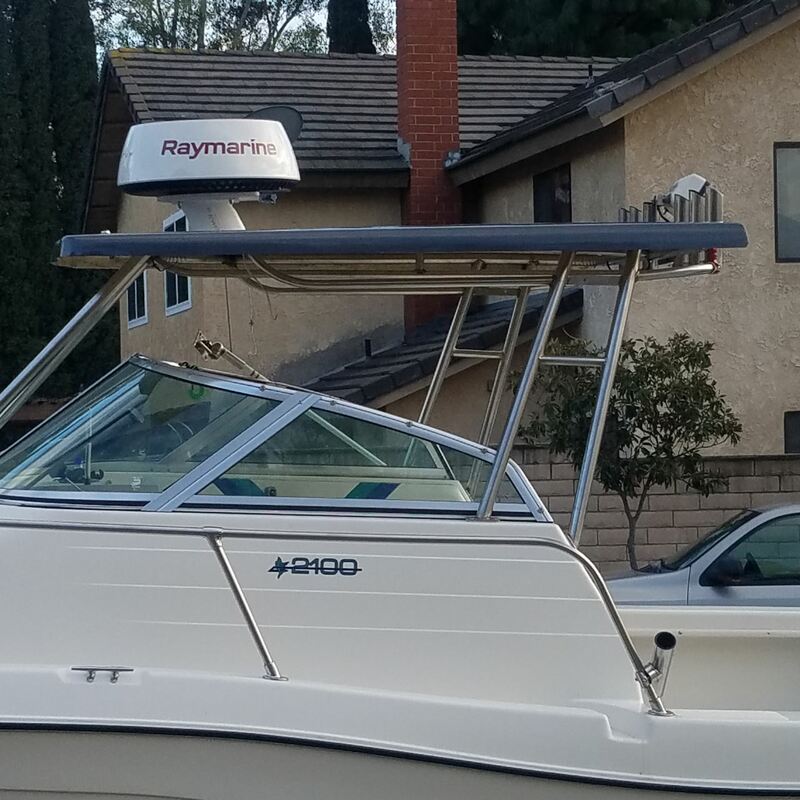 When they agreed it appeared smaller, they high-fived one another. If the fish looked close, they collectively held their breaths as the challenger’s official weight was announced before they broke out in boisterous cheers and chants. 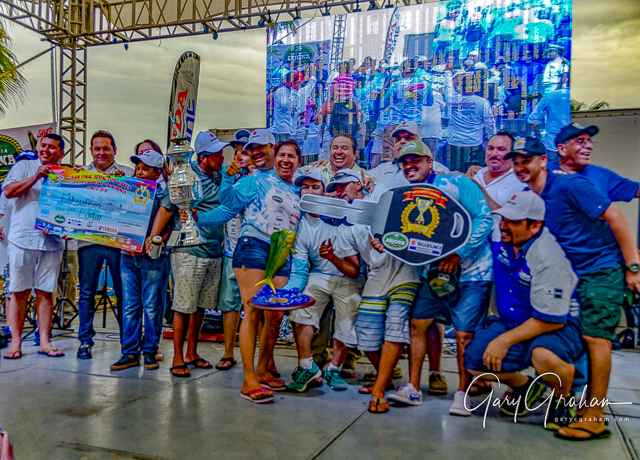 When “Team Renovados,” with angler Gerardo Ivan Prado and the remainder of the team uncovered their huge dorado at near-closing time, “Team Marmakos” stared apprehensively as sparkling golden fish was hoisted up on the scale. The weighmaster gazed intently at the slowly spinning fish, waiting for it to stop moving. 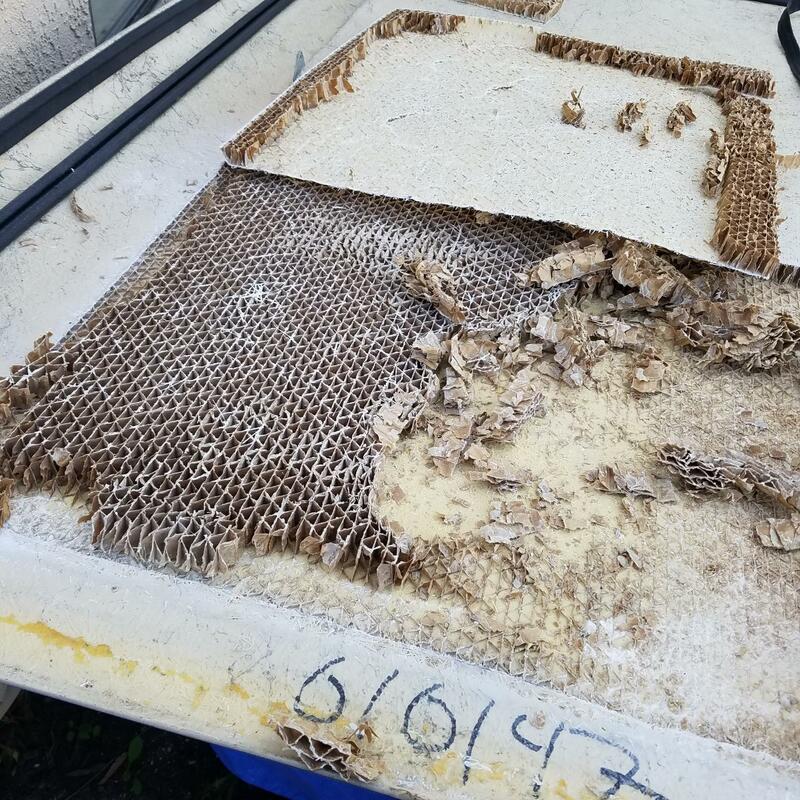 Everyone around the scale kept their eyes glued to the numbers; finally, the digital numbers settled and stopped. 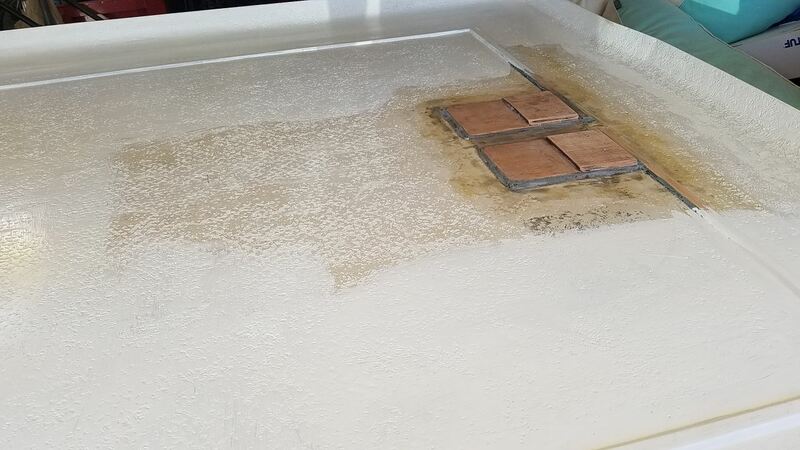 The weigh-master bellowed: “FORTY-ONE POUNDS” (pause) “AND NINE OUNCES!” The silence was broken as spectators gasped and “Team Marmakos” erupted in cheers. 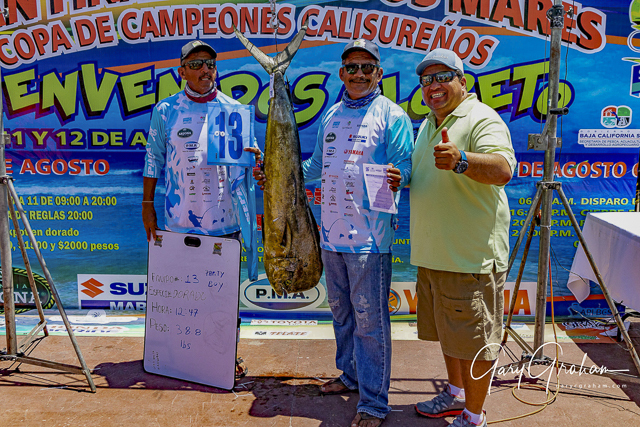 seemed to take forever, “Team Marmakos” anxiously watched for other dorado to be brought to the scale … thankfully, only a few much smaller fish were brought in to be weighed and photographed. 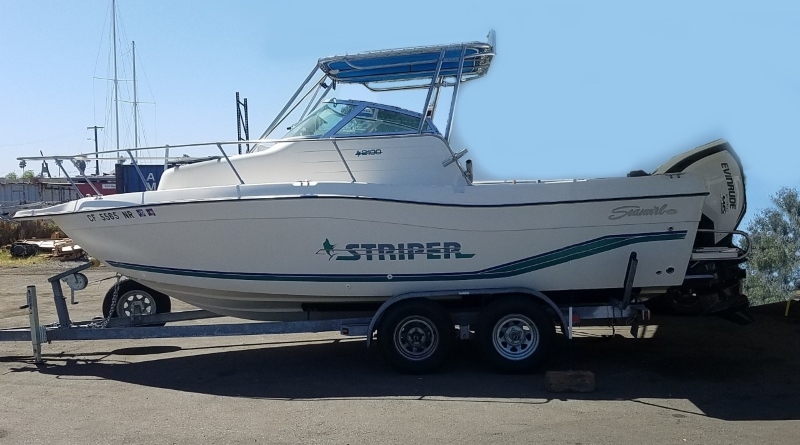 At last, the weigh-station was officially closed, and the team sighed with relief and agreed to more pictures. 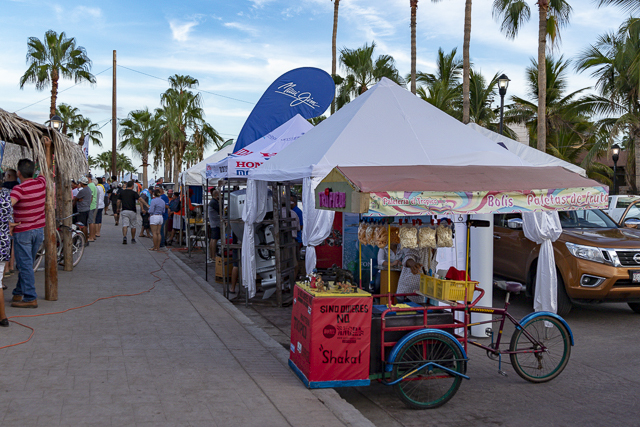 Later that evening the Awards dinner was held on the Malecon overlooking the Loreto Marina. 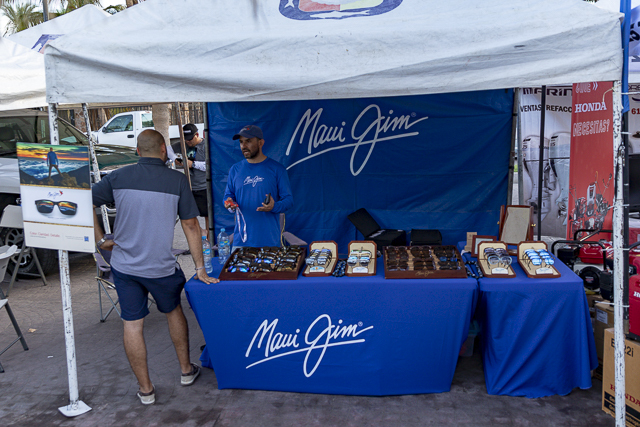 Seafood dinners were served to the more than several hundred team members and their families that attended the event. 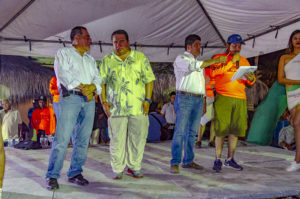 The Fiesta atmosphere continued as teams mingled renewing old friendships along with some new ones. Apparent winners strutted, as they celebrated their good fortune, (luck or skill? ), while other teams not so fortunate congratulated them, vowing among themselves that next year would be different. The nights festivities began with an avalanche of games, raffle items and other prizes before local and visiting dignitaries were introduced. 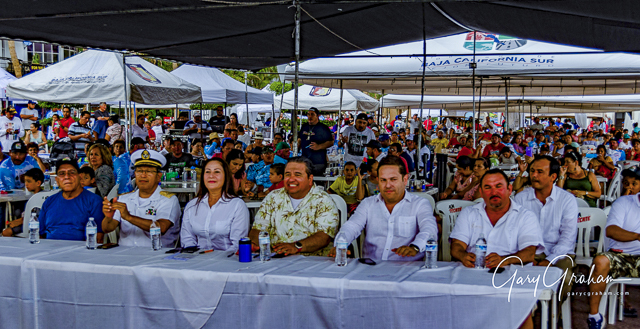 From left to right; Manuel Salvador Talamantes Romero, General Secretary of Loreto; Rear Admiral Gabriel Pablo Gonzales Contreras, Commander of Santa Rosalia’s Navy Sector; Arely Arce Peralta, Mayor of Loreto; Luis Andrés Córdova Urrutia, Secretary of Fisheries in Baja California Sur; Luis Humberto Araiza López, Secretary of Tourism In Baja California Sur and Alvaro Murillo Romero, API Loreto. 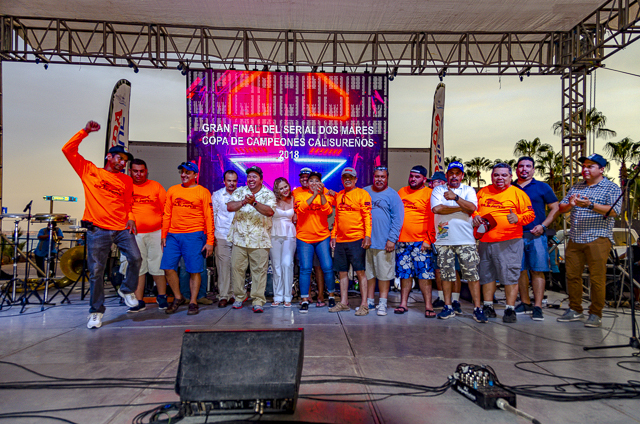 Closing the event many of the staff, volunteers and dignitaries gathered on stage to thank everyone for their participation and wish them good Luck in the 2019 Dos Mares Series. When I flew back to Tijuana and crossed via CBX to the United States, my flight was filled with tournament participants that couldn’t stop talking about how much fun the event had been and that they were going to do their best to qualify in one of the 26 tournaments held during the following year. 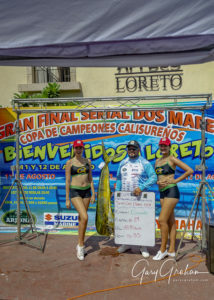 While the fishing was not wide open, there were enough opportunities to catch dorado to keep the fishing interesting. 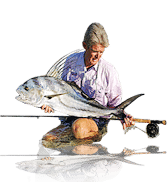 Most of the larger, winning fish had been found 30-miles offshore, not in close like the traditional dorado fishery used to be. The fish caught closer in were of the smaller variety with very few larger ones mixed in. 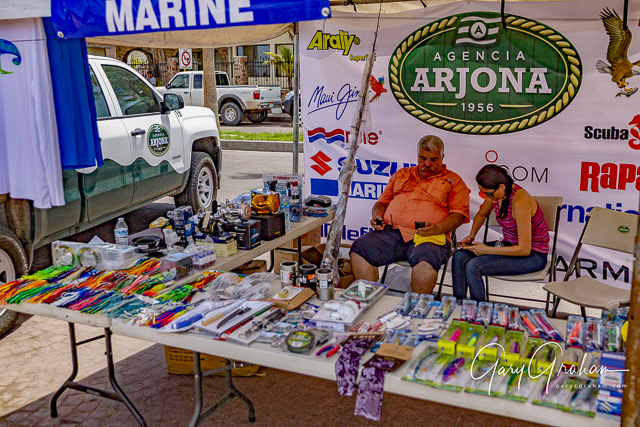 The other comment that was heard was how much fun and inexpensive the local events were, as well as what a marvelous opportunity to get to know some of the local anglers who were quite willing to share their knowledge of their area with the visiting fishermen. 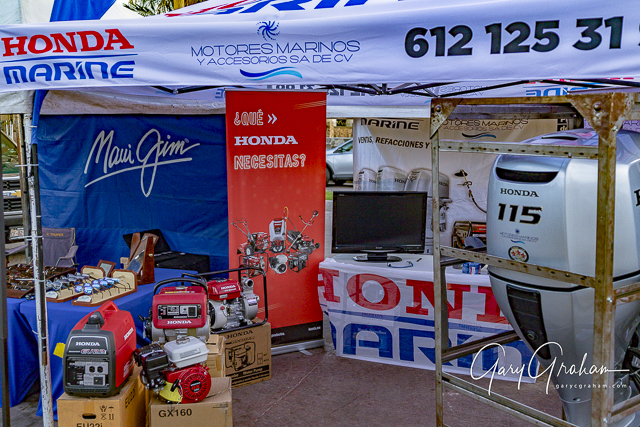 PMA / Yamaha 01 motor marino FB $260,000 2nd place (Renovados) Yamaha de 75 HP, 4 tiempos.